Outlaw’s Patriot was conceived at Montgomery’s Hickory Hill Stables in the spring of 1989. His sire is Missouri’s Outlaw owned by Doug and Jane Montgomery; and his dam is Miss Sensation, then owned by Larry Robbins. 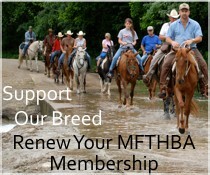 We monitor mares bred to Outlaw each year. This was one cross I sure wanted to monitor with the show records of both sire and dam, and the Outlaw-Sensation bloodline cross. Outlaw’s Patriot (Pedro) was born in the spring of 1990. Larry said, “He’s another champion, Doug.” The next two year’s passed slowly and I made every effort to harness my anxiety and not to act interested in the colt as I planned one day to own him. I arrived and we visited for a while. Brian told me that Larry Robbins had just been there a couple of days ago and had dropped off a colt out of Outlaw to be broke. My heart skipped a beat, Pedro had arrived. I ask Brian if he had ridden the colt. He responded, “A couple of times,” with a cool, sly smile. It was cold and late, but I just had to ask. “Would you ride him a few circles for me?” He agreed and got him out. He was like his daddy all over. Brian rode him about six circles and I said, “Put him up.” My heart was pounding as I said to myself, “This is it – I have to have that colt”. We went to the office and I asked Brian if I could use the phone. He said, “sure,” and asked no questions as he sat and listened. I got Larry out of bed and we began to visit. I can tell you, if you don’t know Larry, you do not trade with him in a few minutes. Besides he is no one’s fool. When I was President of the MFTHBA, Larry was Vice-President and he was one of the most critical thinking people with whom I have been associated. After an hour of negotiation, I owned the horse. I returned to my room for a sleepless night. My intentions were to keep my purchase a secret, but anything good cannot be kept a secret. I told Brian there was no hurry, to take his time as I wanted him sound and to have time to develop. I have some clients and partners in other interests I have, and they, knowing I was in the horse business, had expressed a desire to get involved. I had found what we were looking for as an outstanding prospect and advised them. A limited partnership was formed, MOYOSOFO, who is now the current owner with me as the manager. We chose not to stress him for the Two Year Old Futurity. The summer was passing and Pedro was progressing as planned. We debated on holding him back for the Three Year Old Futurity, but so many people felt that he was the horse to win the Championship at Ava. We consented and set our sights for Ava. The rest is history. Pedro won the Two Year Old World Championship Stallion division and Two Year Old Reserve World Grand Champion. Thanks to all his supporters. He is now laid up for the winter at Montgomery’s Hickory Hill Stables, and can be visited there in person or seen on pages 52 and 53 of the MFTHBA 1992 Celebration catalog.